Your precious pooch’s nose can give you signs as to whether your beloved Bruno is doing well and is healthy or not. But, it is normal for the wetness of your dog’s nose to change from time to time, it may sometimes be very wet or completely dry. It is actually an old dog’s tale (see what we did there) that if your dog’s nose is dry it means that he or she is unwell. A dry nose does not mean a sick dog. Why are dog’s noses wet? Did you know that dog’s sweat through their noses and their paws? Their nose helps them sweat and the mucus that is secreted by your dog’s nose helps trap scents in the air and enables them to smell better. Why does my dog lick her nose? This is a pretty common question. Your dog uses her nose to investigate things. From finding buried bones to identifying other dogs. Doing this can be a messy business, so your dog is just licking her nose to clean it. Sometimes when your dog is sniffing around, the thin layer of mucus can pick up a sample scent of something, when she licks her nose she is moving these samples to her mouth for further investigation by an olfactory organ on the roof of her mouth. What is the connection between the nose and mouth? Dogs have specific scent glands in their mouths - pretty cool, right? Your dog’s ability to smell is about 1000 times more sensitive than humans. There is a gland that acts as a connection between the nose and the mouth known as the Jacobson’s Organ. This organ is great for helping your dog to assess and investigate things and know information on other dogs such as health and age. Experts believe that dogs can also smell cancer and detect Orcas in our ocean from more than a kilometre away! 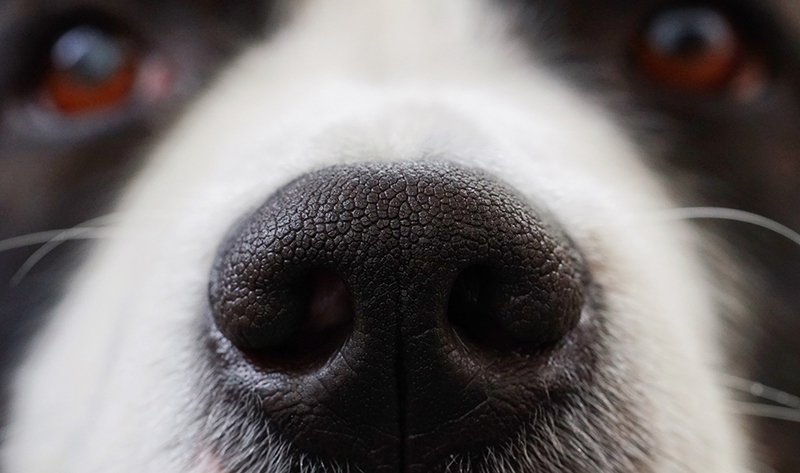 Each nostril in your dog’s nose helps them to identify and locate various smells. The slits on the side of the nose are where your dog will exhale, therefore allowing for the air to circulate properly. A wet nose helps to facilitate all of these abilities! Is it a bad thing is my dog has a dry nose? A dry nose does not always mean that your dog is unhealthy or that something is wrong. But, if your dog’s dry nose is also accompanied by changes in his behaviour, appetite or health such as diarrhoea, vomiting or loss appetite, then speak to your vet. If your Bruno’s nose is bleeding or cracking or has any bumps on it then you should see your vet. Having pet insurance will help cover the costs of vet visits. ● Dehydration - make sure your dog has water! If your dog has a dry nose and is still acting happy and healthy, then you shouldn’t have anything to worry about. What if my dog’s nose is too wet? If your dog has a very runny nose then this might be an issue. If the runny nose persists then this might be because of allergies. If you notice some sort of strange discharge such as smelly or cloudy discharge, then this could be a sign of infection, issues with the nostril shape (Pugs often suffer from this) or a condition such as distemper. Speak to your vet if you notice any of the above issues. If your dog’s nose is bleeding and this does not stop after a few minutes, then see your vet. So, basically, a wet nose and a dry nose are normal? Yes! For the most part, a dry nose or a wet nose is normal! But the trick is to keep an eye on your dog for any changes that might come with a very wet or a very dry nose such as issues with behaviour or health. Keep your dog healthy and happy (and your wallet) with pet insurance so that the ‘what if’ vet visits don’t turn into ‘oh no’s’ in your bank account. Dog insurance is the best thing you can do for you and your beloved Bruno (or Mittens). Here’s how to start running with your dog so that you will both love it!